Free stuff always appeals to me, whether it be free food (yum), free money (yes please) or free holidays (still waiting on this one). Yet when it comes to free music and/or free music videos to boot, I'm all over it. Cue a great giveaway. 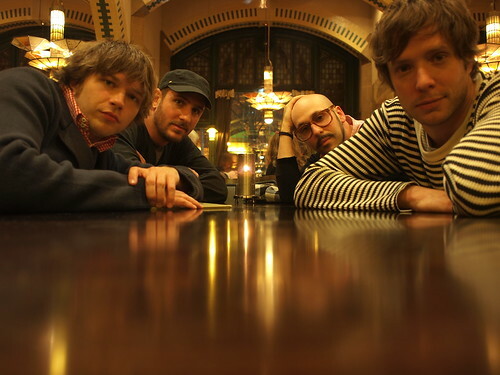 The genius that is OK Go have decided to give away their new video for 'End Love' for free. That's right, FREE!! And all you have to do is head to their website and get it straight from the lads themselves. And to sweeten this already molasses injected deal, if you upload the video on your FB page and get copious amounts of comments, you could score yourself some more goodies from them. There's nothing wrong with wanting more, right?? As for the video itself, well it's another creative masterpiece that will leave you amazed. A stop motion video shot over what looks like 2 days and edits timelessly and beautifully into 4.29minutes. Keep an eye out for Orange Bill, aka The Goose, that is either playing the roll of 5th member/groupie or is indeed their new bodyguard. None the less Orange Bill's appearance is hilarious and a highlight for me. Let me know what you think of it and the track itself.